You are on Queen's View. Skip to the next section. Queen's View lies at the heart of Highland Perthshire, and it's the area's most popular visitor attraction. Just one look is enough to tell you why. 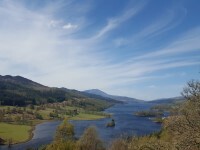 When Queen Victoria visited in 1866, she assumed that the sweeping view west along Loch Tummel was named after her – but she was wrong. We think the view was really named after Isabella, the first wife of Robert the Bruce, who lived more than 500 years earlier. Today, you too can enjoy views fit for a queen – along with a nice cup of tea at the café. Pick out some gifts at the well-stocked shop and relax before exploring the nearby forests. For more information about Queen's View including parking charges and opening times please click here (opens in new tab). You are on Trail Information. Skip to the next section. 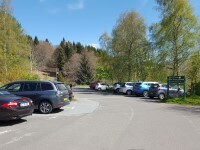 For more information about the Trail and Viewpoint please click here (opens in new tab)..
Take the B8019 west of Pitlochry. Queen's View is about 7 miles (11 km) from the town. The entrance to the car park is at grid reference NN 864 598. PH16 5NR is the nearest postcode. 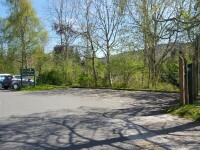 You can catch a bus to Queen's View from Pitlochry, which takes about 15 minutes. Check Traveline Scotland for times and fares. 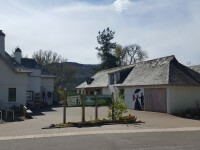 The nearest Railway Station is Pitlochry. Staff do not receive disability awareness/equality training. There are mobility aids available. The mobility aids available include wheelchairs. 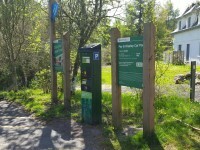 Forestry Commission leaflets, maps and publications can be provided in alternative format, for example, in large print or in another language. For more information please contact: The Diversity Team via telephone: 0300 067 5000 or e-mail: diversity@forestry.gsi.gov.uk. 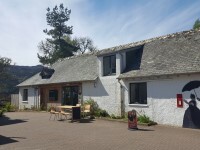 There is a wheelchair available to borrow in the cafe, this can be used for the Queen's View Trail. 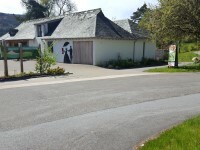 The car park is located at the front of the visitor centre. There is/are 3 designated Blue Badge parking bay(s) within the car park. The dimensions of the designated Blue Badge parking bay(s) surveyed are 480cm x 610cm (15ft 9in x 20ft). There are parking charges for the car park. Parking is not free for visitors of the venue. Payment signs are clearly presented. Payment term signs do make it clear if parking charges apply to Blue Badge holders. 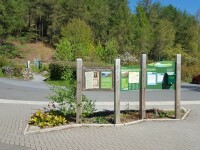 Payment machines are located throughout the car park. You are on Queen's View Visitor Centre. Skip to the next section. For more information about the Information Centre and Shop please click here (opens in new tab). 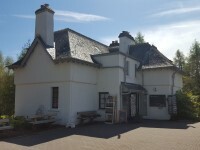 For information about the Queen's View Cafe and toilets please click here (opens in a new tab). You are on Car Park to the Trail. Skip to the next section. 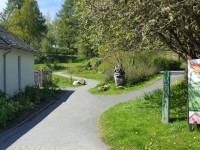 The start of the trail is located to the right of the cafe building (as you face it). 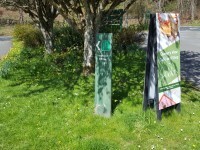 There is step free access from the car park to the trail. 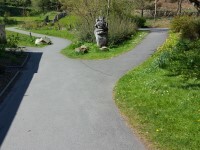 There is a tarmac path leading from the cafe building to the trail. Follow the path on the left which leads to the trail.